DOC Guest Blog by JILA and University of Colorado Student Ben Bloom with JILA/NIST Fellow Jun Ye. 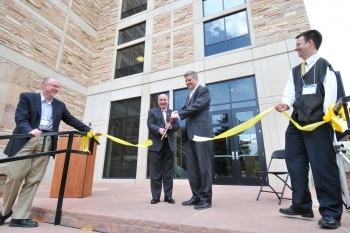 JILA is a joint institute of NIST and the University of Colorado Boulder. 40° 0.435', -105° 16.116' -- that’s where I work. I know this because my smart phone says so. The same phone that woke me up in the morning, reminded me to give my dog his heartworm medication, and that I routinely use as a flashlight. But how does this small, everyday piece of technology know where I am? Sixty years ago when somebody set out to build atomic clocks, surely they had different goals in mind, something big and of a national scale you would think. Nobody could have imagined a handheld box for every citizen good for watching cat videos and also for advanced communications of all sorts. My phone (and yours!) knows exactly where on Earth it is and how to drive to the nearest gas station because of atomic clocks. The Global Positioning System (or GPS) is an intricate dance of many atomic clocks floating in the space above our heads, declaring to the world what time they read. By listening to a few of these clocks, your phone can pinpoint your exact location. But the most amazing part of all of this is the fact that those atomic clocks whizzing by, orbiting our planet, are already dinosaurs in the context of today’s technology. 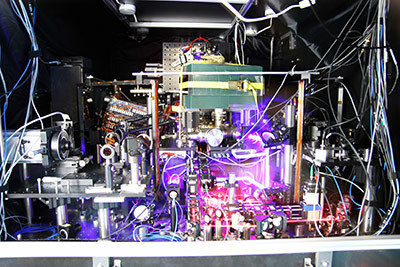 Research results published today showcase a new type of atomic clock built by a team of NIST and JILA researchers in Boulder, Colorado. I am privileged to be part of that team, led by Jun Ye. The new type of atomic clock is 10,000 times more precise and stable than the clocks used in space today. By creating a clock based on a few thousand strontium atoms, a metallic element, trapped by laser light, we have been able to demonstrate a radically different alternative to standard atomic clocks that define the international unit of time, the second. These new experimental clocks will allow for a new set of applications that could excite technology enthusiasts and serve the nation. Applications we can only dream of today. Imagine being able to understand the composition of the ground underneath you by flying an atomic clock over a landmass, “teleporting” huge amounts of information across a quantum network supported by these clocks, or maybe even listening to the subtle gravitational waves emitted by a binary star as the wave sweeps by an array of these clocks. A network of these clocks will be the ultimate probe of the still mysterious space-time of our universe, and will help explore the frontiers of the bizarre quantum world. I don’t know if or when our clocks will re-define the second, be used in a new GPS that could pinpoint my location to an inch, or be some integral piece to a quantum computer, but one thing is for sure: I can’t wait to find out.